During and beyond the twentieth century, urbanization has represented a major demographic shift particularly in the developed world. The rapid urbanization experienced in the developing world brings increased mortality from lifestyle diseases such as cancer and cardiovascular disease. We set out to understand how urbanization has been measured in studies which examined chronic disease as an outcome. Following a pilot search of PUBMED, a full search strategy was developed to identify papers reporting the effect of urbanization in relation to chronic disease in the developing world. Full searches were conducted in MEDLINE, EMBASE, CINAHL, and GLOBAL HEALTH. Of the 868 titles identified in the initial search, nine studies met the final inclusion criteria. Five of these studies used demographic measures (such as population density) at an area level to measure urbanization. Four studies used more complicated summary measures of individual and area level data (such as distance from a city, occupation, home and land ownership) to define urbanization. The papers reviewed were limited by using simple area level summary measures (e.g., urban rural dichotomy) or having to rely on preexisting data at the individual level. 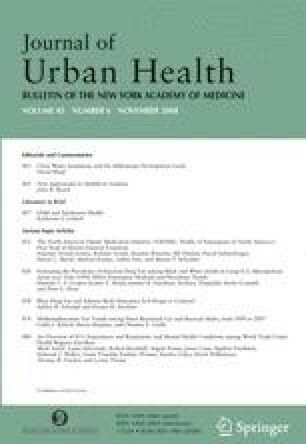 Further work is needed to develop a measure of urbanization that treats urbanization as a process and which is sensitive enough to track changes in “urbanicity” and subsequent emergence of chronic disease risk factors and mortality. The online version of this article doi: 10.1007/s11524-008-9325-4 contains supplementary material, which is available to authorized users. World Bank. World Bank list of developing countries. Available at: http://web.worldbank.org/WBSITE/EXTERNAL/DATASTATISTICS/0,,contentMDK:20421402~pagePK:64133150~piPK:64133175~theSitePK:239419,00.html. Accessed on: April 1, 2007.